A music video created with special education high school students in a workshop at the Brooklyn Transitions Center, Brooklyn. This Fearless Theater Company workshop was funded and supported by CUNY’s College Now in Fall, 2004. A documentary on a theater performance workshop with high school students from Beach Channel High School and special education students from PS 233, Far Rockaway. The students wrote and performed scenes before a live audience. This FTC workshop was funded and supported by CUNY’ s College Now in Spring, 2004. Two workshops of students from the High School of Leadership and Public Service and High School of Economics and Finance present their ideas and feelings about 9/ll. Their schools are located very close to Ground Zero. (28mins) Produced with The Educational Alliance, The After School Corporation, The New York Times Fund. Directed by Lynne McVeigh. Filmmaker: Anita Weber. In June 2002 “History Makers” was screened for students, teachers, parents, and friends of both high schools and was covered by ABC and CBS eleven o’clock local news broadcasts. Since then it has been presented at numrous conferences on traumatic stress caused by 9/11, including most recently European Conference on Trauma (June, 2007) universities, and high schools and was the subject of “Through Their Own Eyes: A Media-based approach to Adolescent Trauma, an article co-written by Lynne McVeigh, Co-direcor of The Fearless Theater Company and Drs. Carol Tosone and Caroline Rosenthal Gelman of New York University’s School of Social Work, published in the International Journal of Psychotherapy, July 2005. An advertising campaign designed to raise consciousness about “access” — the needs of young people with disabilities to be provided with all the services and benefits of community life. “Good-Bye Fifties, Hello Nineties” (documentary style PSA) produced in 1996. Aired on NY public access television station. Would You Like to Dance? (drama) produced in 1997. Four future spots have been scripted and include animation by John Canemaker, puppet live-action by Eric Jacobson and artwork by Ethan Cornell. Based on the life of Louis Armstrong, “Satchmo’s Gang” is the story of a group of teens with disabilities who surprise their fellow students by hosting a dance at their junior high school. “Satchmo’s Gang” began as a short script by Louise Tiranoff. The company worked with Ms. Tiranoff & Ms. McVeigh with the sponsorship of The Film Society of Lincoln Center to develop “Satchmo’s Gang” into a screenplay. Eminent jazz composer and performer Benny Golson came on board to arrange and compose the music, as well as to work with the band, made up of students from LaGuardia High School for the Performing Arts in New York City. In February 1995, at The Walter Reade Theater at Lincoln Center, the company performed the script for radio in front of a live audience, Clips from Louis Armstrong movies were shown and the live jazz band performed. The show was broadcast in 8 parts on WNYU-FM in New York City. 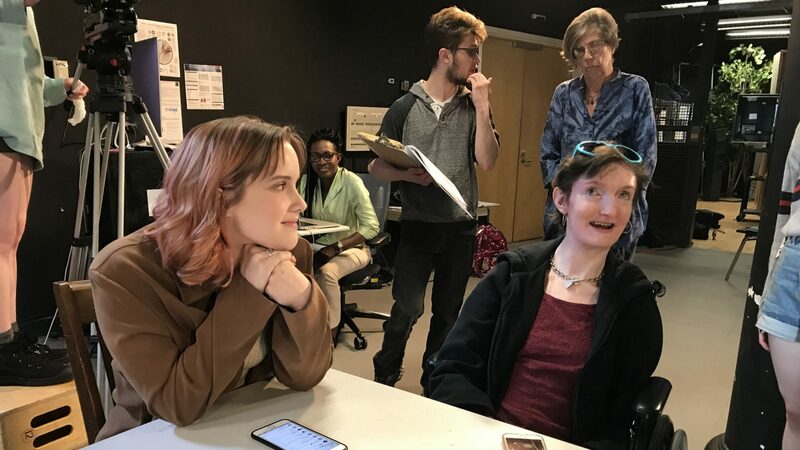 A music video created with special education high school students at Manhattan’s School of Career Development, New York City by The Fearless Theater Company and funded and supported by CUNY’s College Now. The students assisted in the planning of the video as well as performed in it during Spring 2005. Fearless Theater & The Passport Program at Lincoln Center are profiled in this segment for Manhattan Neighborhood Network Television produced by Fearless Theater member Liz Longo. Includes interviews with Bette Knapp, Lynne McVeigh, and company member Victoria DaVila. From March 2 to April 26th, 1997, Fearless Theater collaborated with Lincoln Center’s children’s program “Passport To The Performing Arts” (Department of Programs and Services for People with Disabilities), and New York University’s Radio Department, to create a new radio show “The Wendy & Gabby Show.” Wendy and Gabby star, with Gary the Weather Guru, Tessa on Traffic, George & JJ: Investigative Reporters. The first episode segments include humorous banter and announcements, musical performances by The Third Street Music School and students of Gale Sholiton, an on-location report on wheelchair basketball, and a hard hitting investigative segment on homeless children and families. The National Basketball Association taped a segment for their show “Inside Stuff” when Fearless Theater taped the basketball segment. The premiere episode of “The Wendy and Gabby Show” was aired on WNYU-FM’s “Headphone Theater” in April, 1998. “I feel that through this program, kids with disabilities have had a venue to communicate with the rest of us — helping us to see them as the wonderful, funny, complex, interesting people they really are — not just a group of kids in wheelchairs. The spirit of the Fearless Theater Company grew out of a show “Claire’s Broom Detective Agency,” written and directed by the company’s founder Louise Tiranoff, and starring Itzhak Perlman who plays a famous violinist who has lost his Stradivarius. This theatrical performance explored the amazing and diverse world of music and dance. The Company’s regulars, with and without disabilities, young dancers and singers, special guests: tap dancer/choreographer Marion Coles and composer/saxophonist Benny Golson, and the puppets of “Sesame Street’s” Eric Jacobson (Jake Pianofingers) and Steve Widerman (Legato, the Cat). June 5th & 6th, 1998, at the Tisch School of the Arts (press release enclosed). 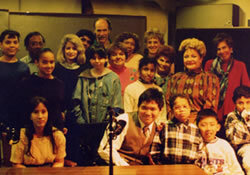 A performance of improvs and dramatic scenes by special education students from the Hungerford school, Staten Island with FTC members before the entire school on June 1st, 1999. The rehearsal and performance were taped and is now a documentary (press release enclosed).